Tales from the kitchen of an event planning entrepreneur. 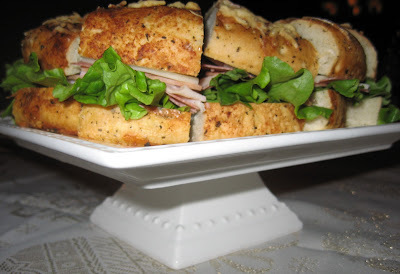 Since I have kind of been on a kick lately with "quick and easy" posts, I wanted to share with you the EASIEST party sandwich on the face of the earth. I know this would be so much better if I were to take the time and make the foccacia bread from scratch, but sometimes when I am in a bind and I want something to look pretty for my party I take a cheaters route and in this case... my result is always wonderful. The biggest thing to remember when hosting is that sometimes simple is better. If you have spent 3 hours decorating cupcakes, take a break and make a really easy appetizer, sandwich, dip, or salad. Sometimes things I just "throw together" on the fly are the things I get the most positive feed back on. This past Saturday, I held a baby shower for my sister-in-law and wanted something filling but pretty to put on the table amongst the other lighter items. I had made this delectable little sandwich for our ugly sweater party and never even got a bite... so I thought I would make it again. The most beautiful thing about a sandwich...in my mind... is that they never get old and the possibilities are endless. 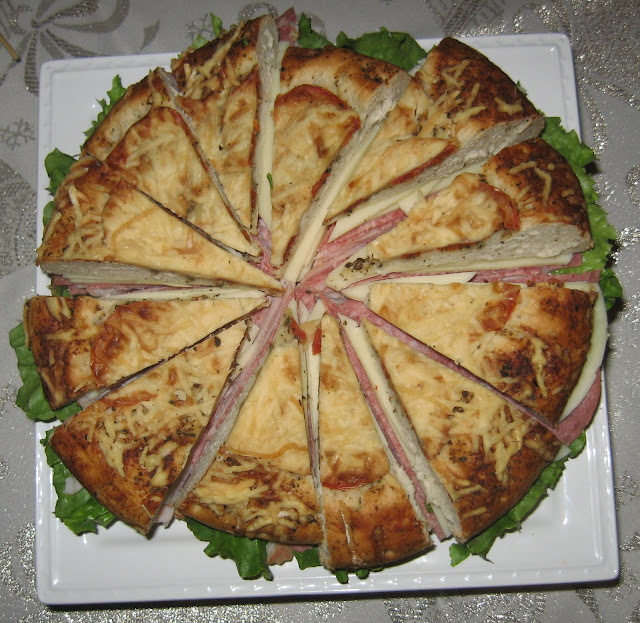 Serve on a cake stand or decorative plate with mustard and mayo on the side. Note: If you prefer to add mustard and/or mayo to the sandwich prior to serving the sandwich will likely get soggy and any leftovers will not store well. I love easy little pretty party ideas. Hope you enjoy!